I have noticed a growing trend with new seed stage venture funds - their Limited Partners (their investors) tend to be, in part, other VCs. At Susa Ventures, we are no exception. We have some great LPs that are later stage VCs. This makes sense for so many reasons, but until starting Susa, I never thought about how great this can be for the entire value chain. - They understand VC. The good, the bad the ugly. You can skip the generic stuff during your fundraising pitch, and once they fund you, they are some of the most helpful LPs. They can send deals, share trends, make introductions, and more. - The fund's portfolio companies can gain access to these LPs for follow on funding, and likewise, these later stage VCs get and eye into an early stage portfolio in hopes of funding a couple of them. Although I am a huge fan of this, you have to be careful to manage expectations and conflicts of interest. As long as the later stage VC knows that you will make decisions first and foremost on behalf of your companies, I think you can avoid problems. Everyone should work in sales at some point in his or her career. It doesn't matter what you sell. Knives, office supplies, paint, phones, software, whatever - it really doesn't matter. Sales jobs teach you valuable lessons. Everyone in a company, regardless of role, is a sales person in one form or another. Sure, sales people actually sell the product, but CEOs sell investors on the vision, CTOs sell the CEO and board on technical direction, engineers sell their managers on realistic milestones and expectations, HR sells the CEO on new perks they want to provide to attract better talent, etc. I have worked in both sales and marketing roles for a number of years, first at Silver Spring Networks, and then at Integrate. I learned many valuable lessons both in direct selling as well as managing a sales team. 1. Know your customer. Since everyone is really in some form of sales, then everyone has a customer. Know your customer. Personality, likes, dislikes, what motivates them, what problems they have, etc. The most effective sales people sell to people, they don't just talk about the product. They sell to the customers' wants, problems, and aspirations. For example, if you are a developer looking for more responsibility, don't sell your VP of Engineering on the fact you have free time to work on more stuff; instead, know exactly what makes your VP of Engineering nervous about the next build and sell him on why you are the best person to work on that. Know your customer. 2. Business people are people, too. Sometimes we forget that behind that business title, there is a person who has interests, worries, a family, stresses, insecurities, etc. It's always important to build a personal and human relationship with people before you ever try to get something from them, sell them something, or work with them. It doesn't mean you have to get to know them for a year, but trying to connect with people on a human level never hurts. Also, just like our significant others and moms, business people like knowing you care and think about them. Send them an article you think they might like, a card, etc. 3. Sell them oxygen, not aspirin. Oxygen is something you can't live without; aspirin just masks the pain, but doesn't fix the core problem. For example, if you are selling enterprise CRM software, it would ineffective to pitch it as 'this software will make sure you build stronger relationships'. Perhaps a more effective way to pitch it would be 'this software will increase revenue, help you grow faster than your competition, and become profitable/hit your earnings targets'. Said another way, sell why you do what you do, not what you do. What you do might be relationship management software, but why you do it is to help businesses utilize the tools to grow revenue and become more efficient. I googled around yesterday and couldn't find anything. If anyone can point me to one, that would be great. Or maybe we need to put it together. The best example I can think of is Google. Larry and Sergey began developing a search engine called BackRub in 1996 that ran on Stanford servers. They would later rename it to Google. They were both doing research in Computer Science. If you can think of others, feel free to leave them in the comments. As a VC, I think there is opportunity here. I used to hear that VCs in the early days (70-90s) used to crawl universities searching for new technologies. I don't know if this is true, but I think there was a greater % of new tech coming from universities at that time than there is now. Because computer science was new back then, universities, such as Michigan were some of the first to really make progress in this new world. Fast forward to today, and building SW is cheap and easy. Everyone can do it. I for one have spent little time mining university research for potential spinouts. Perhaps I should spent a little time thinking about what that would look like. Everyone complains the Valley is no longer creating 'real' tech, maybe they are just looking in the wrong places. We are excited to officially announce the launch of Susa Ventures, a $25 million seed fund that invests in data-centric founders and businesses. We started Susa as four friends with the shared belief that despite the hype, the multitude of companies being formed, and the hilarious acronyms, the data revolution is underappreciated. We have barely scratched the surface of how a focus on leveraging data to make critical business decisions, automate processes, and inform new product creation will disrupt incumbents and create new industries. Companies with a maniacal focus on data have become the breakout stars by amassing a moat of increasingly voluminous and complex assets. Examples range from companies like Twitter, which evolved from a communication tool to being the dominant keeper of the world’s most valuable real-time social data, to Waze, with crowdsourced maps, directions, traffic, and incident reports. Whether generated by machines or humans, companies like Climate Corp and Quora have shown that their ability to aggregate, analyze, and deliver actionable insights yield increased defensibility and significant competitive advantages. In Health, there is immense value in combining existing data (claims, EMR, genomics, gov’t, trials) with new sources (sensors, mobile, social feeds) to enable better diagnostics, decision support, precision, and preventative medicine -- both at the individual and population level. Data-centric companies like Flatiron Health, Zephyr Health*, and SolveBiothat have set out from the start to create one or more connectable repositories of critical and relevant information (i.e. data on people, lifestyle, drugs, procedures, microbes) that will help us much more rapidly discover treatments, cure diseases, and extend life. In Banking and Finance, sophisticated machine learning models applied to vast data sources (e.g. social, purchase histories, events, biometrics) are making it possible for young companies like LendUp*, Addepar, and Wealthfront to break down current monopolies like FICO, Fidelity, and First Data to reinvent everything from credit scoring and ID verification to fraud detection. Startups like Standard Treasury* are helping traditional banks move money and data more efficiently through APIs and digital gateways, while companies like Robinhood* are eliminating friction from equity investing. In Education, there will be vast improvements in K-12, higher ed, and adult learning. Overall access to global coursework is improving rapidly via the efforts of 2U, Udemy, and Code Academy. Additionally, Panorama Educationand Clever are making all the data produced by parents, teachers, schools, and students more digestible and usable, enabling easier analytics for a variety of critical use cases. On the other end, Declara* is helping adults in the workforce perform their jobs more effectively by connecting them to the right content and people on a collaborative platform. These are just a few illustrative examples across a handful of industries. Everything from legal to manufacturing to commerce will undergo a step function improvement by collecting, analyzing, and applying data in smart ways. We hope we can help many of these companies jumpstart their vision to become the market leaders in their respective fields. Check out our portfolio here, with a few stealth companies still to be launched. While there is a proliferation of seed funds of late, Susa Ventures is different in a few critical ways: a) we’re the only $25M seed fund with four operating partners - giving us the ability and capacity to really work with founders in a meaningful way, b) all four partners have either been founders or operators, and bring complementary skills and expertise in areas ranging from product marketing to software engineering to customer acquisition, c) our team consists of both male and female partners, and d) we cover three major geographies - Bay Area, LA, NY. We feel these differences are our core strengths, enabling us to create a fund that is truly founder friendly in all the ways that matter. Lastly, a big thank you to our incredible group of LPs for joining us in this journey -- we would not be able to do what we love without them. If you share our enthusiasm for data, please contact us! When I saw this I got so excited. We all know that music discovery is a pain. Everyone has their own homegrown strategies. It feels like note taking in that sense. Everyone uses a different process - smashed together apps, manual processes, etc. The major music platforms launched 'radio' features, which is just okay. Many others swear by Hypem which is better, but still just okay. But this idea of SongHunt, a 'ProductHunt for songs', a daily leaderboard of the best songs got me so excited for a couple of reasons. 1. Its daily - It would be different everyday. The 'radio' feature on most music platforms will begin to repeat pretty quickly, and will even play similar playlists if you play the same station. 2. Community driven - I tend to trust highly curated communities more than recommendation engines. If you curated the community in the right way, a la how Ryan has curated the PH community, you would truly get great content. 3. Diversity - music, even more so than products, comes in more flavors. Music discover is all about exploring the different types, sounds, genres, cultural roots, etc. I can't wait for people to tackle this. My friend Jeff and I might take a crack. The technology sector can be a rather insular and homogenous establishment. Your success, failures, impact and legacy are always compared in a relative fashion to the other apps, founders, and investors. That's why when I read this article about Data Science for Social Good I got really excited. For all the crap the technology sector gets for cranking out 'yet another photo sharing app', we produce exponentially more meaningful technology that never gets the attention it deserves. At Susa Ventures, we tend to look at data intensive businesses and founders. The technologies that we see everyday are amazing, and usually include some form of data science, machine learning, and or NLP. I've always wondered what it would look like if we pointed some of that tech directly at social good issues that were not constrained or burdened by the need to build a company or make a profit. This program is the answer to my curiosity. Although I am a passionate capitalist at heart, and often feel that for profit entities are a better way to solve problems than non-profits, I am all for experimenting with what I would call 'technical non-profits'. I suspect the output of this organization will be orders of magnitude larger than its counterparts. I hope Data Science for Social Good changes my, and many others', perspective of what a non-profit can look like and the impact they can have. Inventing new UIs and UXs on the internet is hard. But every once in a while, companies develop and entirely new experience that immediately captures the love of users. The facebook news feed, the leaderboards of Reddit, or the pin board layout of Pinterest are all great examples. As I read this post yesterday, about Houzz raising a massive round, I couldn't help but think it looked similar to Pinterest, which also raised a massive round of it's own not so long ago, however both companies took very different approaches to the unicorn club. Houzz feels like a vertically focused Pinterst board with some tools to help you act on your inspiration. That's it. Pretty simple. But pretty powerful. What's amazing is that Houzz raised at a valuation that is almost half of what Pinterest raised at. Pretty incredible to think that they peeled off a single vertical, really nailed it, and built a very large business in a short amount of time. It's a great reminder that you can build incredible value with a vertical play. I think part the reason why vertical plays can be valuable is that you can build specific tools tailored to that vertical. For example, it's easier to build a lead generation funnel on a single vertical than a lead generation funnel for everything that on Pinterest. Furthermore, I think a single vertical has a better chance of building a really strong community. I think Hacker News and Product Hunt were great examples of vertically focused r/reddits. Furthermore, there are many companies that have copied Pinterest for a specific verticals, and don't even get me started on the number of sites that have been inspired by the newsfeed for sports, politics, etc. For me, the important take away is not to discount vertically focused companies or ideas. Often times, really knowledgable founders, such as those from Houzz, Product Hunt or Hacker News, see an opportunity in a very large and neglected market and can build a great business with tools specifically tailored to that industry. I wrote a great tweet yesterday that no one commented on. So naturally, I am going to blog about it. I live in NYC. Like most New Yorkers, I love exploring everything this city has to offer. One of the very best things is the public space - the gyms, parks, fields and courts. But buying and carrying around a basketball, tennis racket, soccer ball, or bocce ball set can be a burden. Just like the Citi Bike ride sharing program, I want a 'play sharing' program for all the things that make public spaces so much fun. I think the city would be willing to sponsor this, or at least put a grant toward it. It would help maximize the utilization of the public spaces. Never again would I have to see a sad tennis court on West Side Highway go unused, or a basketball court on Canal go untouched just because the great citizens of NYC can't find a ball. 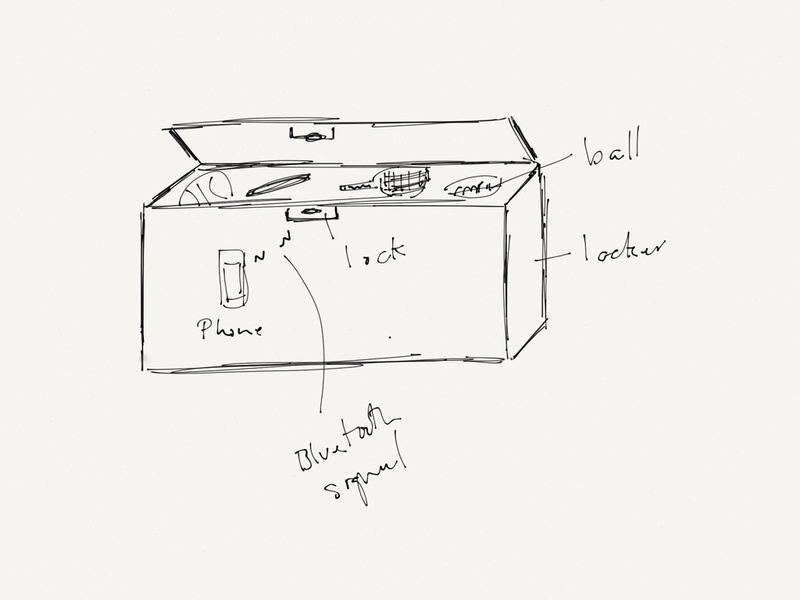 Imagine a BLE-enabled locker that can be opened by a smart phone. Each item inside (balls, rackets, frisbee, etc) have a RFID tags so you know exactly what was removed when opened or put back in. Users would create an account and add a credit card. They could walk up to any of these lockers at fields, courts, parks, or gyms and rent a item for $5/hour or whatever. Then just return it when they are done. Most of this technology exists, and I have seen the RFID stuff work for other applications, namely for inventory tracking. The lid could be controlled in a similar way to some of the new smart bike locks or even Citi Bike. This is doable. I think this would be awesome. If you think this would be awesome too, hit me up and we can build it. My friend Joe recently posted this story to facebook. It reminded me about all the other crazy stories I have heard and read about Elon Musk. From funding his own crazy ideas to get them through tough times, to attempting to build the first private space transportation company (SpaceX), to reimagining transportation (Tesla) and renewable energy (SolarCity). Elon has always made bold bets. As I think more and more about the best VCs, they too have always made bold, often crazy looking bets. Unicorns usually don't start off looking as magical as they end up. Early investors in Google looked crazy. At the time, Google had no business model, inexperienced founders, and were playing in a very crowded market. The examples are endless. At Susa, I want to make sure we are thinking big enough. Making bets that may look questionable at the time, but have the potential to be category creators or winners. I think the same kinds of people that make great founders, make great investors. And the inverse seems to be true as well. Just look at founding partners of A16Z, Khosla, Sequoia, etc. There are obviously exceptions, but people who see the world differently tend to make the biggest splash. If @elonmusk wasn't so busy reinventing space travel, transportation and renewable energy, I bet he would make a badass VC. On Demand Everything - what comes next? Steve Schlafman from RRE put together a great presentation called On Demand Everything. If you haven't checked it out, do it. I always appreciate when people share their great research. It's how we all move this thing forward. I have reviewed his presentation a number of times. At Susa Ventures, we see a ton of companies building on demand services, and his presentation is always a great starting point when thinking about how a new business fits into the space. The key enabler to the on demand economy is the mobile phone. Smart phones are relatively new. Although it seems like we have had them for decades, remember that the iPhone came out in 2007. Apps in the early days primarily just delivered content for this new platform; however as smart phone penetration reached a critical mass, building on demand services became viable. We are now at a point, where essentially overnight, a company can build a product and enable millions of people to book a car (Uber), book a cleaning (Homejoy), order some food (doordash), or get groceries delivered (Instacart). While I think we are still in the early days of imagining and re-imagining what services can be changed with the advent of mobile, it's fun to look a step beyond that. As a consumer, I am already starting to get lost in all the app choices. In the food delivery category alone, you can choose between doordash, munchery, zesty, spoonrocket, fresh direct, sprig, seamless, grubhub, etc. Add in the growing choices in home cleaning, dry cleaning, and grocery delivery and you start to get a bit overwhelmed. I think there is a need for a 'service layer' for the on demand economy. Alfred is a great example of a company that can sit above all these great services and provide a unified customer experience, especially for more repeatable and recurring services. There is a ton of value to capture if you can pull that off. The company that does will understand the customer better than anyone. What they eat, what they wear, how often they travel, etc. But it won't be easy. Just last week, Uber went after 'supply side platform' Breeze. Although slightly different, it's a good example of the big on demand players wanting to own/collapse the entire value chain (as Steve writes in his presentation), and control the user experience end to end, including who is providing their service to customers. I look forward to tracking this space and watching the emergence of the on demand economy's 'service layer'. Thanks Steve for starting the conversation.